Some 50 years ago the Louw Family purchased a farm which they named PUMULANI, which means ‘be at rest’ in Ndebele.The farm house built at that time still graces the premises with its presence to this day. Eventually the farm was subdivided and the current area called Pumulani. A short drive from Lilongwe International Airport brings you to the vibrant capital city of Lilongwe. Major road and rail networks radiate from this point, linking Lilongwe with choice destinations throughout the country. In the heart of this young city, surrounded by several acres of splendidly landscaped gardens, the Lilongwe Hotel awaits you. Mvuu Wilderness Lodge is named after the Chewa word for hippopotamus – Mvuu – and lives up to its name as a great place to spot a good variety of river wildlife. 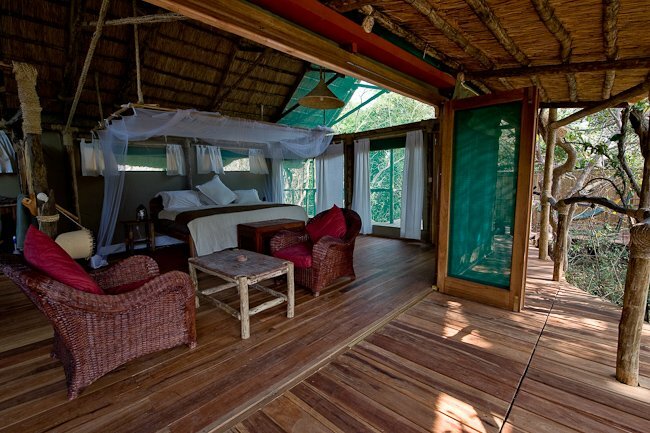 Situated on the banks of the Shire River in Malawi's Liwonde National Park, the lodge has five tents on decks and overlooks a lagoon (a old ox-bow side-channel of the river) where game can very often be spotted coming down to drink.